H1N1 Flu (Swine Flu) and You ! H1N1 (referred to as “swine flu” early on) is a new influenza virus causing illness in people. This new virus was first detected in people in April 2009 in the United States. Other countries, including Mexico and Canada, have reported people sick with this new virus. This virus is spreading from person-to-person, probably in much the same way that regular seasonal influenza viruses spread. Why is this new H1N1 virus sometimes called “swine flu”? This virus was originally referred to as “swine flu” because laboratory testing showed that many of the genes in this new virus were very similar to influenza viruses that normally occur in pigs in North America. But further study has shown that this new virus is very different from what normally circulates in North American pigs. It has two genes from flu viruses that normally circulate in pigs in Europe and Asia and avian genes and human genes. Scientists call this a “quadruple reassortant” virus. Do pigs carry this virus and can I catch this virus from a pig? At this time, there is no evidence that swine in the United States are infected with this new virus. However, there are flu viruses that commonly cause outbreaks of illness in pigs. Most of the time, these viruses do not infect people, but influenza viruses can spread back and forth between pigs and people. Are there human infections with this H1N1 virus in the U.S.? Yes. Cases of human infection with this H1N1 influenza virus were first confirmed in the U.S. in Southern California and near Guadalupe County, Texas. The outbreak intensified rapidly from that time and more and more states have been reporting cases of illness from this virus. An updated case count of confirmed novel H1N1 flu infections in the United States is kept at http://www.cdc.gov/h1n1flu/investigation.htm. CDC and local and state health agencies are working together to investigate this situation. Is this new H1N1 virus contagious? CDC has determined that this new H1N1 virus is contagious and is spreading from human to human. However, at this time, it is not known how easily the virus spreads between people. 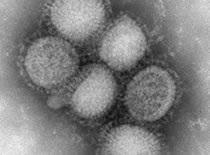 The symptoms of this new influenza A H1N1 virus in people are similar to the symptoms of regular human flu and include fever, cough, sore throat, body aches, headache, chills and fatigue. A significant number of people who have been infected with this virus also have reported diarrhea and vomiting. Also, like seasonal flu, severe illnesses and death has occurred as a result of illness associated with this virus. How severe is illness associated with this new H1N1 virus? It’s not known at this time how severe this virus will be in the general population. CDC is studying the medical histories of people who have been infected with this virus to determine whether some people may be at greater risk from infection, serious illness or hospitalization from the virus. In seasonal flu, there are certain people that are at higher risk of serious flu-related complications. This includes young children, pregnant women, people with chronic medical conditions and people 65 and older. It’s unknown at this time whether certain groups of people are at greater risk of serious flu-related complications from infection with this new virus. CDC also is conducting laboratory studies to see if certain people might have natural immunity to this virus, depending on their age. Can I get infected with this new H1N1 virus from eating or preparing pork? No. H1N1 viruses are not spread by food. You cannot get this new HIN1 virus from eating pork or pork products. Eating properly handled and cooked pork products is safe. Tap water that has been treated by conventional disinfection processes does not likely pose a risk for transmission of influenza viruses. Current drinking water treatment regulations provide a high degree of protection from viruses. No research has been completed on the susceptibility of the novel H1N1 flu virus to conventional drinking water treatment processes. However, recent studies have demonstrated that free chlorine levels typically used in drinking water treatment are adequate to inactivate highly pathogenic H5N1 avian influenza. It is likely that other influenza viruses such as novel H1N1 would also be similarly inactivated by chlorination. To date, there have been no documented human cases of influenza caused by exposure to influenza-contaminated drinking water. Can the novel H1N1 flu virus be spread through water in swimming pools, spas, water parks, interactive fountains, and other treated recreational water venues? Recreational water that has been treated at CDC recommended disinfectant levels (1–3 parts per million [ppm or mg/L] for pools and 2–5 ppm for spas) does not likely pose a risk for transmission of influenza viruses. Currently, there are no documented human cases of influenza caused by exposure to influenza-contaminated swimming pool water. No research has been completed on the susceptibility of the novel H1N1 flu virus to chlorine and other disinfectants used in swimming pools, spas, water parks, interactive fountains, and other treated recreational venues. However, recent studies have demonstrated that free chlorine levels recommended by CDC are adequate to disinfect highly pathogenic H5N1 avian influenza virus. It is likely that other influenza viruses such as the novel H1N1 flu virus would also be disinfected by these chlorine levels. Can H1N1 influenza virus be spread at recreational water venues outside of the water? Yes, recreational water venues are no different than any other group setting. The spread of this novel H1N1 flu is thought to be happening in the same way that seasonal flu spreads. Flu viruses are spread mainly from person to person through coughing or sneezing of people with influenza. Sometimes people may become infected by touching something with flu viruses on it and then touching their mouth or nose. First and most important: wash your hands. Try to stay in good general health. Get plenty of sleep, be physically active, manage your stress, drink plenty of fluids, and eat nutritious food. Try not to touch surfaces that may be contaminated with the flu virus. Avoid close contact with people who are sick. Are there medicines to treat infection with this new virus? Yes. CDC recommends the use of oseltamivir or zanamivir for the treatment and/or prevention of infection with these new influenza A (H1N1) viruses. Antiviral drugs are prescription medicines (pills, liquid or an inhaler) that fight against the flu by keeping flu viruses from reproducing in your body. If you get sick, antiviral drugs can make your illness milder and make you feel better faster. They may also prevent serious flu complications. During the current outbreak, the priority use for influenza antiviral drugs during is to treat severe influenza illness. If you are sick, limit your contact with other people as much as possible. Do not go to work or school if ill for 7 days or until your symptoms go away (whichever is longer). Cover your mouth and nose with a tissue when coughing or sneezing. It may prevent those around you from getting sick. Put your used tissue in the waste basket. Cover your cough or sneeze if you do not have a tissue. Then, clean your hands, and do so every time you cough or sneeze. Washing your hands often will help protect you from germs. Wash with soap and water or clean with alcohol-based hand cleaner. We recommend that when you wash your hands -- with soap and warm water -- that you wash for 15 to 20 seconds. When soap and water are not available, alcohol-based disposable hand wipes or gel sanitizers may be used. You can find them in most supermarkets and drugstores. If using gel, rub your hands until the gel is dry. The gel doesn't need water to work; the alcohol in it kills the germs on your hands. If you live in areas where cases have been identified and become ill with influenza-like symptoms, including fever, body aches, runny nose, sore throat, nausea, or vomiting or diarrhea, you may want to contact their health care provider, particularly if you are worried about your symptoms. Your health care provider will determine whether influenza testing or treatment is needed. If you are sick, you should stay home and avoid contact with other people as much as possible to keep from spreading your illness to others. If you become ill and experience any of the following warning signs, seek emergency medical care. What is CDC doing in response to the outbreak? CDC has implemented its emergency response. The agency’s goals are to reduce transmission and illness severity, and provide information to help health care providers, public health officials and the public address the challenges posed by the new virus. CDC continues to issue new interim guidance for clinicians and public health professionals. In addition, CDC’s Division of the Strategic National Stockpile (SNS) continues to send antiviral drugs, personal protective equipment, and respiratory protection devices to all 50 states and U.S. territories to help them respond to the outbreak. Studies have shown that influenza virus can survive on environmental surfaces and can infect a person for up to 2-8 hours after being deposited on the surface. Local health officials have full control of SNS medicine once supplies are deployed to a city, state, or territory. Federal, state, and local community planners are working together to ensure that SNS medicines will be delivered to the affected area as soon as possible. Many cities, states, and territories have already received SNS supplies. After CDC sends medicine to a state or city, control and distribution of the supply is at the discretion of that state or local health department. Most states and cities also have their own medicines that they can access to treat infected persons.